This bill would waive the earning limit for retired officers returning to certain work. This bill would dismantle the Department of Public Safety. This bill would set a minimum wage. This bill would require health coverage for SCPORS disability retirees. This bill would set up a progressive disciplinary process for Dept. of Public Safety officers. This bill would establish a Capitol police agency. This bill would prohibit physical arrest for DWLR. This bill would protect the job of employees who miss work for volunteer emergency services. This bill would prohibit any governing body from recognizing any public employee union or association with regard to collective bargaining. This bill would set up an earned, paid sick leave law. This bill would establish a member class three in SCPORS. On March 19th, the Low Country Chapter of the South Carolina Police Benevolent Association held a political screening for candidates running for Goose Creek City Council. During the screening process, Brandon Cox demonstrated why his experience and values make him uniquely qualified to represent the voters of Goose Creek. This is a list of all of the endorsed candidates that the SCPBA has endorsed in 2016. We would like to congratulate each of these candidates on their endorsements and we hope to work with them into the future to help make the law enforcement profession better for our members. Please show your support for these candidates at the polls. On Monday, December 14, 2015 the South Carolina Division of the Southern States PBA presented several Columbia police officers with checks from the Police Benevolent Foundation. 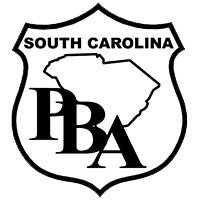 The Police Benevolent Foundation and the South Carolina Division of the Southern States PBA rallied behind several Columbia police officers that were greatly affected by the flood.